There’s no denying that a lionfish, beautifully striped yet as pesky as a rat, is intriguing to see up close. For a group of 12- and 13-year old Bermudians, who dissected and even tasted the fish during a Spirit of Bermuda voyage, it was a highlight of their four-day journey. Since 2006, more than 3,000 young islanders have participated in the expeditionary learning program provided by Bermuda’s tall ship, Spirit of Bermuda. The annual middle school program fosters intellectual and character growth through structured science, math, engineering and technology-based shipboard lessons, and also supports the Bermuda Public Schools curriculum. For eight years BIOS staff members and volunteers have teamed with the program’s sponsor, the Bermuda Sloop Foundation, to teach the students snorkeling. During their time in the water, students increasingly spot the non-native lionfish gorging on juvenile fish on the island’s surrounding reefs. “We ask the students on our snorkel trips to keep an eye open for them, and if any are spotted, we go back (once students are out of the water) and try to spear them,” said BIOS educator and Ocean Academy director JP Skinner, who is licensed to cull the fish and submits data about each fish to local scientists. Among them is BIOS biologist Gretchen Goodbody-Gringley, who is leading the Bermuda Lionfish Taskforce’s investigation into the lionfish abundance around the island. The taskforce is working to draw up a plan to control this invasive species. Lionfish are native to the Indo-Pacific, but in the mid 1980s people released a few individuals into Florida’s coastal waters. Since then their descendants have invaded the Gulf of Mexico, the Caribbean, and the shores of the mid-Atlantic region of the United States. The first lionfish documented in Bermuda was a juvenile collected in a tide pool on the southern shore in 2000. Within four years, lionfish were ubiquitous in Bermuda. In previous years, Skinner said they have seen only a couple lionfish at shallow reefs (at deeper reefs, the lionfish populations have been much more dense). But this year, especially early in the season, they saw several on each student trip in shallower areas. 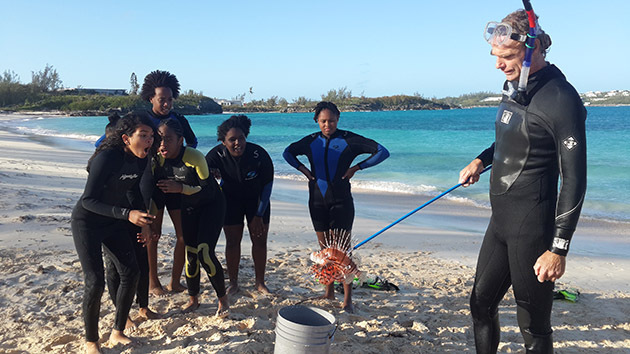 Though students were familiar with lionfish and their impacts on reefs, the 21 female students from Sandys Secondary Middle School on a mid-winter trip had not studied them closely until BIOS volunteer Allister Stewart stepped on to the beach and presented one on the tip of his spear. Though dissection revealed that this particular lionfish had little in its stomach, these ravenous consumers are known to eat up to 30 fish at a single feeding, which can have dramatic impacts on fish populations. Skinner noted that although most of the middle school students knew that the fish was venomous, some didn’t know it is edible. When the students asked what lionfish tasted like, they got a chance to find out after Skinner turned the lionfish fillets over to the ship’s chef. He provided small bites that night at dinner.